It has been about 150 years that Kaliningrad (Königsberg) has been manufacturing dump-cars. The history of the dump-car manufacturing has began with the creation of the Limited Liability company in Königsberg. The traditions of the dump-car manufacturing in the postwar years have been continued by the Kaliningrad Railway-Car Building Company. The design developments of its employees were being applied in many other enterprises around the Soviet Union. The products were being exported to several countries around the world, including: Cuba, Syria, Iran, Poland and Mongolia. 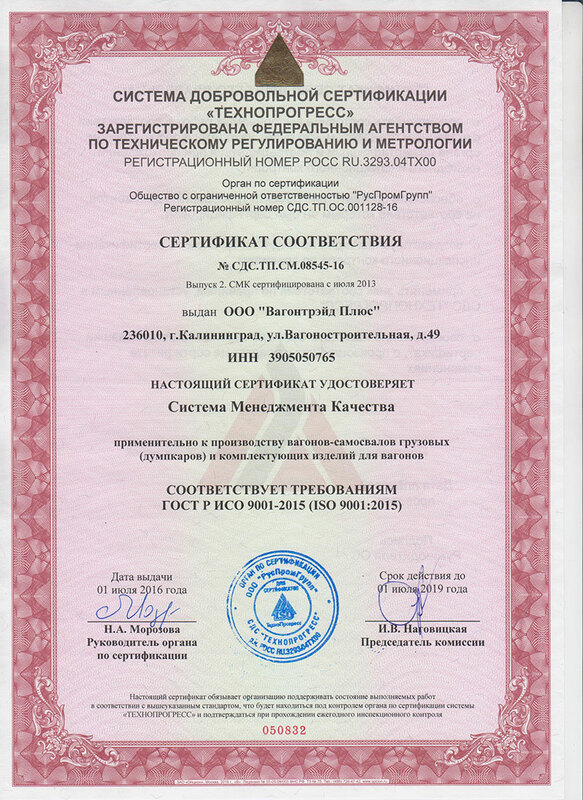 JSC «VAGONTRADE PLUS» was established in April 2003 in Kaliningrad (Russia). The main activity of the company, according to Charter, is the production of dump-cars and its spare parts. Currently, JSC «VAGONTRADE PLUS» is practically the only company in Russia to produce dump-cars for various coal mining and other mining enterprises, that is seeking to maximize the substitution of imports to Russia of this type of lifting equipment. JSC «VAGONTRADE PLUS» holds a developed infrastructure, a great machinery equipment, including some of the very unique equipments, too. It also has an experimental site for the development of new dump-cars and great experts for this job. They have a high level of technical knowledge to be able to develop and implement any kind of project. The tri-axle bogie was especially designed for the dump-cars, to be used on the railways with a rail-gage of 1520mm. It was designed for the mining cmpanies to use it on slopes of no more than 60‰. The state of such railway roads complies with the Building Norms and Rules. The main objective of the development is a creation of a tri-axle bogie with an axle load of 27 tc which includes enhanced load-bearing elements in the construction. The prototype of this bogie is another tri-axle bogie model Nº 18-522, whic is mass-produced by Ural Rail-Way Car Building Company.